Search Guadalupe and Railyard District homes for sale below! Browse the newest listings with Santa Fe Properties. With a rich history, recent revitalization of the Guadalupe and Railyard District neighborhood in Santa Fe has made this a hip place to live and work. The 50-acre Railyard Park offers a welcoming community gathering place with a rich mix of tenants, including restaurants, hotels, galleries, boutiques and public arts space. Additionally, this community is the birthplace of the Farmer's Market and non-profit organizations such as SITE Santa Fe, Hispanic cultural center, El Museo Cultural, and teen art center, Warehouse 21. And with more than 13 acres of open space of parks, plazas, a promenade and gorgeous real estate, what else could you want? Don't miss an opportunity to invest in homes for sale in the Railyard District! Browse the newest listings below or keep reading to learn more about this Santa Fe community. Be the first to see Railyard District real estate listings & gain access to advanced search tools. Register with Santa Fe Properties to get started! The Railyard District real estate consists of mostly single family homes and condos priced between the upper $200s and mid $500s. Residences are mainly adobe casitas that are within walking distance to all of the amenities that the Railyard District has to offer. Inside these properties, you'll find extreme amounts of character. From engineered flooring to gas fireplaces to private courtyards to exposed beams, these homes are truly a Santa Fe dream. Additionally, Railyard District real estate offers a handful of spectacular chef's kitchens. State-of-the-art appliances, custom cabinetry and marble, quartz, granite or bamboo countertops are not uncommon throughout these residences. It's easy to see that these homes will appease even the most discerning of buyers. 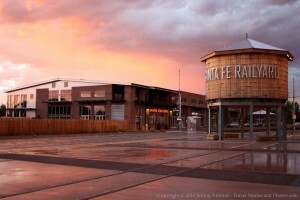 Located between Montezuma and Cerrillos Rd., Santa Fe Railyard always has something happening for residents and tourists alike. The Guadalupe historic district is widely known for its selection of elegantly refurbished abobes and walking distance to nearby restaurants, shops and galleries. There's also a pleasing number of schools as this community is served by the Santa Fe Public School District. With 31 schools to choose from, you can rest easy knowing your children are receiving a top-notch education. Contact Santa Fe Properties today for more information about homes for sale in the Guadalupe and Railyard District. Or simply call us at 505-982-4466.